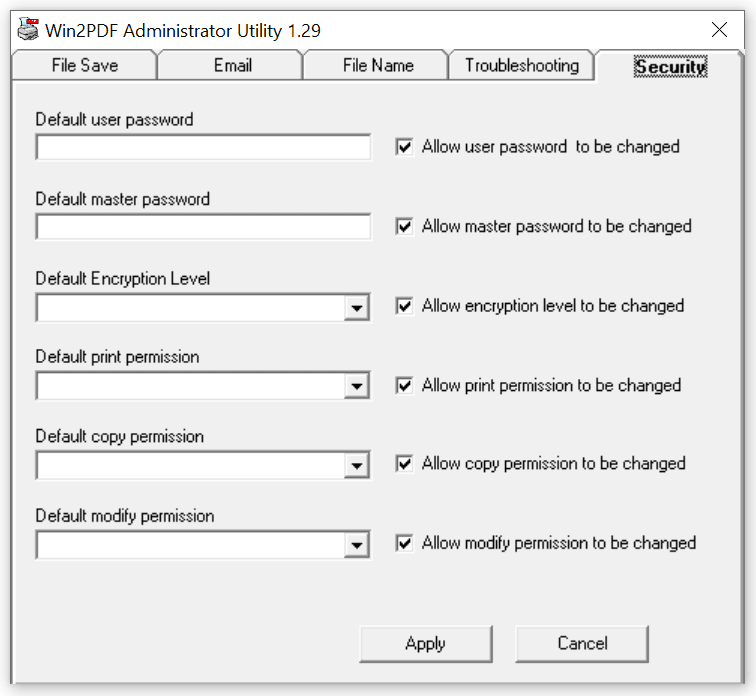 The fifth tab of the Win2PDF Admin Utility allows you to set default security options. These options are ONLY applicable to the Win2PDF Pro and Win2PDF Pro Terminal Server Edition (TSE) versions of the software. Default [feature]: These boxes allow you to set default passwords or other security features in the Win2PDF file save window. Allow [feature] to be changed: When these checkboxes are enabled ("checked"), it will allow the user to change these values in the Win2PDF file save window. When these checkboxes are disabled ("unchecked"), it will not allow the user to change these values. The features will appear "grayed out" in the interface.